Karla Perez is a praised executive, respected by her peers and lauded in articles about her success. She’s the proverbial corporate climber — someone who started out as a medical records clerk at Valley Hospital; became the chief executive officer of Desert Springs Hospital while still in her 30s; and now serves as the regional vice president of the acute care division of Universal Health Services. It was a 14-step climb in the hospital management company based in King of Prussia, Pennsylvania. She helped grow UHS’s reach here after it first entered the market in 1979 with Valley Hospital. Perez joined the company in 1983, when the population was only 200,000 and there were only four medical records clerks in the state. 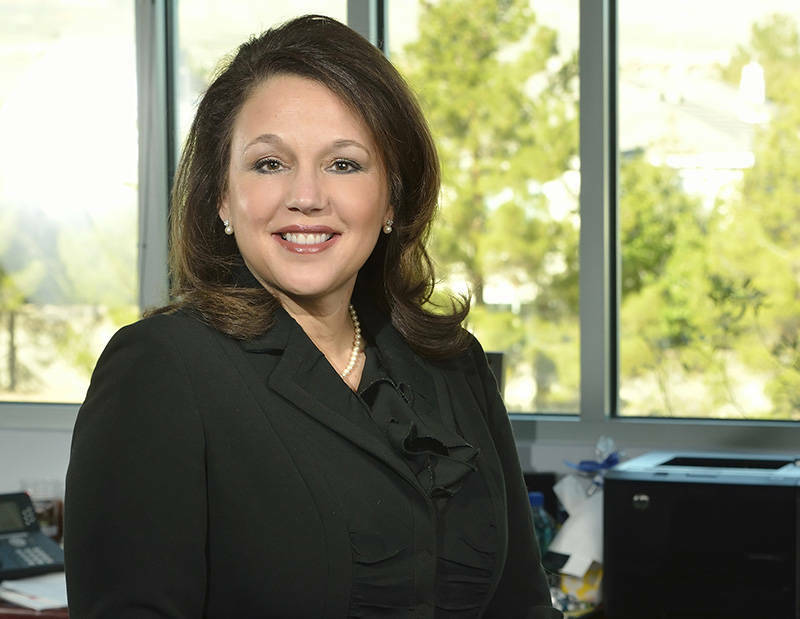 She later approached Community College of Southern Nevada, now known as College of Southern Nevada, to discuss starting a health information management program that would place others in the pipeline to keep up with area growth. From then on, proactive moves to help build more services for the community aligned with her climb upward in management, including her company’s petition of schools to expand their nursing programs. But this particular ride was set in place a few decades ago when Perez, a high school student in the small town of Kiel, Wisconsin, was meeting with her guidance counselor about her future. Her career test suggested a focus on science, but her interest was administrative. Once she discovered that her guidance counselor’s daughter was a medical records administrator — the perfect marriage of Perez’s two career interests — she realized her career path. Perez graduated from the University of Wisconsin-Milwaukee with a bachelor’s degree in medical records administration, now called health information management, and headed to Las Vegas to begin a residency at Valley Hospital. What would have happened if the counselor’s daughter had been a zoo biologist? “Who knows,” she said with a smile as she walked into an elevator at Summerlin Hospital, part of a sprawling campus where her office is located. It’s an interesting question because, to some, Perez’s footprint here has been invaluable. She oversees eight hospitals and serves a population that has grown tenfold since her arrival. “She has been at the top of her game for years,” said Sam Kaufman, CEO of Henderson Hospital. “If she’s compared to baseball, she’d be a five-tool player. Run, hit, field, throw — all the tools. She’s got all the tools. Paul Stowell, chief market strategist for City National Bank, has a similar sentiment about Perez, a former member of the bank’s advisory board, as the “consummate business professional who leads by example and with a commitment to excellence that helps both the people around her as well as the company she represents. “I have the utmost respect and admiration for Karla because she cares about people and her community — something true leaders have in their DNA,” he said. Perez gives much of the credit for her career to working for a company that believes in promoting from within. Summerlin Hospital, UHS’ second hospital, opened in in 1997 to accommodate the suburban growth in the area. In 2003, its Spring Valley Hospital Medical Center, an acute care hospital, opened in southwest Las Vegas. Centennial Hills Hospital Medical Center opened in 2008. This past year, UHS purchased Desert View Hospital in Pahrump, Nevada. And in October, it opened Henderson Hospital, doubling its expected capacity almost immediately. The hospital, which offers integrative care, is the first property built in the 170-acre Union Village development project at U.S. Highway 95 and Galleria Drive in Henderson. Now that UNLV is about to open its own medical school, Perez is watching. After all, it was a residency program that brought Perez to Las Vegas. Needing an internship, she’d written to all the hospitals in the area. At the time, there were six, she said, and Valley Hospital was the one that responded. After becoming a medical records clerk there, she ascended upward, assuming her current position in 2009. Along the way, Perez took UHS’ formula, combined with her drive and desire to “create bench strength.” She served as a mentor to Kaufman and others. Kaufman, who’s known Perez for more than 25 years, met her when he interviewed for a job, but she didn’t hire him. She opted for someone with more experience, he said. He moved to Las Vegas anyway, worked at another hospital and a year-and-half later she hired him. “I owe a lot of my career to Karla,” said Kaufman, who’s now been the CEO of three UHS hospitals here. “She got promoted. I got promoted. She’s a dynamic woman. She’s mentored a lot of people into (becoming) CEOs. She’s truly my mentor. With a suite of hospitals under her management, new technologies and integrative care, growth in the medical industry here and potential changes to the Affordable Care Act, there is perpetually a lot on her mind. “We anticipate it (Affordable Care Act) will be revisited,” Perez said. As for her noted climb upward, she said, “Don’t be so anxious to be at the top until you’ve experienced the steps in between. It makes you more well-rounded. I’ve changed beds, pushed gurneys. I can’t ever ask someone to do something I haven’t done myself or have a general understanding of. “I could see all the dramatic growth and see the opportunities. Anytime I got to a point in a position (where I) could handle more, I sought out what the next opportunity could be. I was always thinking what the next step was, not 10 steps ahead, (making it) a more strategic and thoughtful step-by-step process.